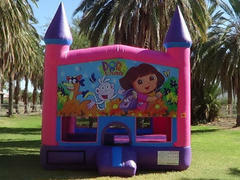 A Child's Joy has been entertaining the kids of Arizona since 1990. We have been voted Best of Phoenix by New Times the only time they've had a category for us. Along the way we have learned a lot about what makes for a successful party. Call us with questions or for reservations or if you have all the information you need you can book everything online. 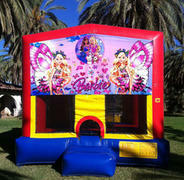 Either way, we'd love to help you create a great event that will become a wonderful family memory. Our Bouncers are perfect for Toddlers and Preschoolers as they have safety netting all around as well as an inflatable step to easy access and to protect them from accidentally falling as they climb out. They have covered roofs and the UV treated netting serves as protection from the Arizona Sun. 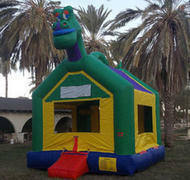 Most of our Bounce Houses have roof safety exits to protect little ones in case of a sudden unexpected loss of power. 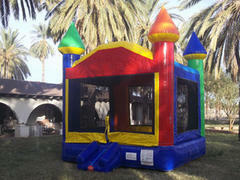 Even our Kiddie Combo Activity Center is designed for ages 5 and under. We have many popular themes for the younger set too. If you've already picked a theme for your party then check below to see what we offer that may compliment your selection. If you haven't settled on a theme then pick one of ours the kids would be excited about and we will help you plan a great party around it! One important area to think about is how to get all those little party guests seated around your great big grown up tables. Solve that problem by adding kiddie size tables and chairs that Goldilocks would proclaim, "Just right!" Of course we have grown up size Tables and Chairs both six foot Banquet Style Tables (rectangle) or 60" Round Tables. We offer lady Clowns that are kid friendly with sweet soft voicesand that gentle touch as sometimes clowns with deep male voices can be scary for the toddlers. They can do Face Painting or make Balloon Animals. Our talented entertainers are available in "plain clothes" too if you are worried that a Clown may make the younger ones uncomfortable. 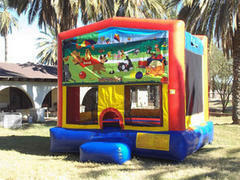 Old MacDonald can "have a farm" right in your own backyard with our wonderful petting zoo. 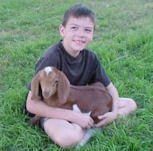 We specialize in adorable hand tamed farm animals raised right here on our family farm. We have selectively bred our critters for the last 25 years for specific qualities and temperment. Many folks around the valley have tried to copy what we do with verying levels of success. But as most people know, you can't just go to the livestock auction and buy a bunch of animals to throw together and call it a petting zoo. Even domestic animals must be raised with love and attention from when they are born to be calm and gentle enough to be around your babies. Our miniature goats and sheep are perfect size for the preschool set. Moms, Dads and Grand Parents are welcomed and encouraged to accompany the kids inside the zoo for a wonderful family experience and great photos. 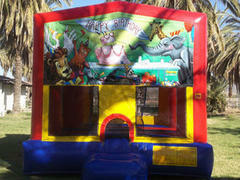 We have a Farmyard Friends Bouncer that can be combined with the Petting Zoo for a Down on the Farm Theme or add a Pony at a discounted rate. Did you always dream of having a Pony come to your Birthday? Or are you one of the lucky ones that actually had Pony Rides at your party when you were a child? Imagine the reaction of your little one when a Pony walks right into the yard during their special day. 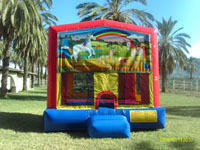 Our cute little Ponies will be the talked most about part of your event. Worried about whether you have enough room for a pony? Anywhere you can walk a big dog we can walk a Pony. If there is too much going on the backyard we can walk up and down the sidewalk out front. We've can use the alley out back or driveways too. Of course a park or neighborhood greenbelt works great too. Our Ponies are in western saddle and hand lead by an experienced handler. Parents can walk along with the little ones if it makes them more comfortable. We also offer Cowboy/Cowgirl hats, Sherriff Badges and Bandanas to complete your party. We do "Reindeer" Pony Rides at Christmas time or offer "Sven" for Frozen Themed Parties. 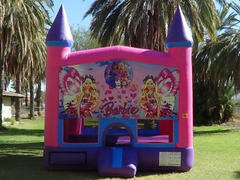 We can put a discount party package together with our Cowboy/Cowgirl Bouncer, Frozen Bounce Houses or My Little Pony Bounce. 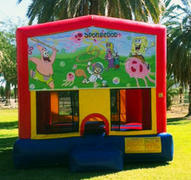 Bounce/Slide Combos are available with those themes too. 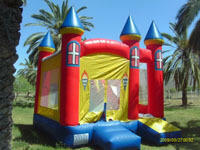 We have great deals on Fun Food Machines when you add them to your order. 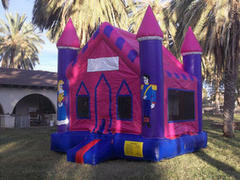 Our Snow Cone, Cotton Candy and Pop Corn Machines help add to the Festive atmosphere. A Hot Dog Roller can be a great help when you are trying to feed a whole bunch of hungry little ones. For even more fun add a Spin Art Machine or Bubble Machine to the mix. 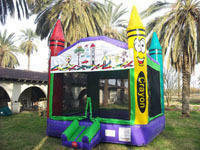 How about some of our classic Carnival Games to keep everyone entertained? They can be an economical way to engage kids of all ages. Don't forget the prizes, we can bring those too. We know how busy you are so if you don't have the time to run all over town, we can take care of the Balloons and Goodie Bags too. 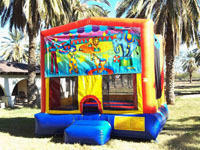 We are here to help make this "The easiest party you'll ever have." When it is hot in Arizona we seek out an escape. 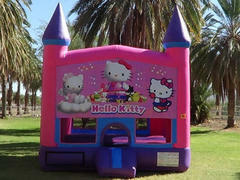 A Child's Joy can help you be the coolest party planner this year with a variety of water toys. You can choose from any of our Water Slides or Slip n Slides for your Toddlers or Preschoolers but there's a few we would like to point out that are perfect for that age group. 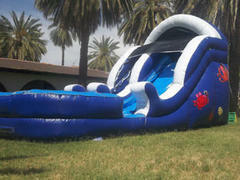 Our Slip n Slide Water Tunnels are really popular for the little ones as they become more of a Bounce and Play ride than a an actual slip n slide. The way a Slip n Slide works the kids (or adults) get a running start and dive onto the sliding surface. 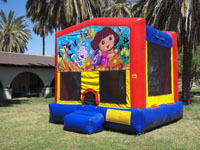 When we first introduced these years ago we learned quickly that the littlest guest had a hard time doing that. They had fun climbing on the Water Tunnel and running, sliding and playing on it in the rain (we have soaker hoses instaled overhead to drip down on them). Our Under the Sea Water Tunnel has a sunscreen that protects your babies from excess sun. We have several smaller Water Slides that are easier for little ones to climb but big enough for big brothers and sisters to have fun too. Some have splash pools for more fun. 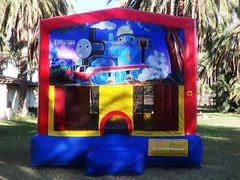 We recommend the front load style for Toddlers and Preschoolers so supervison is easier. The kids stay on the unit longer instead of running around back (tracking mud) out of sight to climb up. 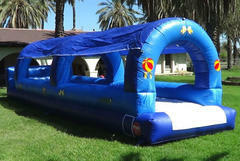 You probably want to check out our Power Paddler Lagoon and Paddle Boats. They are great fun for kids up through elementary age. 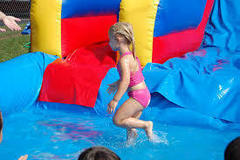 Our Hydro Blaster Balloon Race is a fun way to cool off a party crowd. 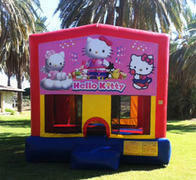 Remember our Bounce/Slide Combos can be setup as a Water Slide during the summer and we can add Misters to any Bounce House Rental when it is warmer out.